Ever since my daughter was small, she has loved to play dress up. She is much older now and loves to dress up even more! I now have three more children and my 2 boys are always trying to get in on the fun with her and dress up too. The problem has been that they never had any costumes to wear. Well, when I received an opportunity to review a costume recently, I opted to receive a costume for my boys for once. Hannah always gets the fun princess dresses so it was time to get a costume for my boys. Costume Discounters is a company that provides hundreds of costumes for men, women and children for all occasions. Whether you are dressing up for a specific holiday or just for fun around the house, this company has you covered! I am pretty picky about costumes and was pleasantly surprised by the vast selection. 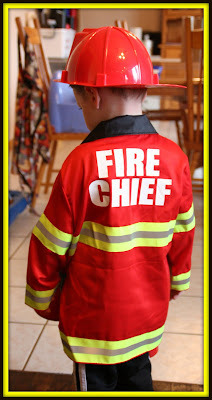 So, for this review I chose to receive the Fire Chief Costume from Costume Discounters. 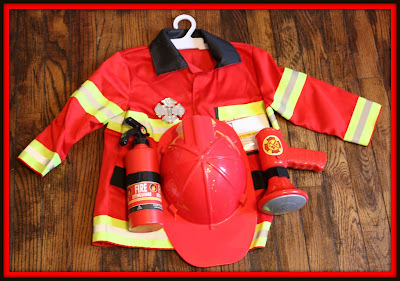 This costume comes complete with a jacket, helmet, badge, fire extinguisher, bullhorn with sound effects and name tag. I love how the jacket has reflective tape on it...totally makes it seem like a real fire chief's jacket! 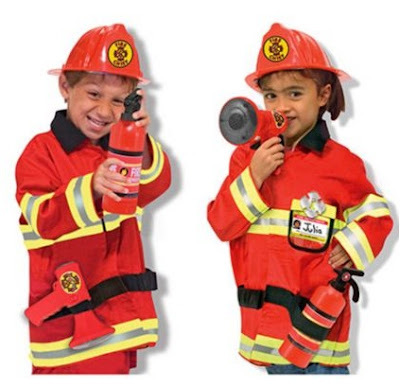 Both the bullhorn and fire extinguisher are designed to fasten to the jacket with Velcro, and this makes it easy for my little guys to keep their "tools" handy. The fire hat came with an adjustable band on the inside to adjust to fit your child's head securely. My boys didn't care for that and took the band out completely. It kept falling out anyway so they were better off without it. Everything you see on the costume is detachable...the name tag is the only thing that my children haven't figured out how to get out yet. The fire extinguisher's top does come off and my boys filled it with water a few times, until they realized that it doesn't actually squirt water...which would have been cool. (Until my house started to get wet...). The sizing on this costume is for children 3X to 6X. My son just turned five and is a BIG five year old so this costume didn't fit him really well. It fit my 3 year old perfectly though. The only thing that we were very disappointed in was the bullhorn. Despite using multiple brands of brand new batteries, it would not work. So we never got to hear what it sounded like. My boys would have loved that but the bullhorn just seemed to be constructed poorly and cheaply and didn't work at all. Despite that though, this costume has provided my boys with some pretty creative and fun play sessions. It has been worn outside too...as they run around the backyard putting out "fires" in the yard and on the play set. As a mom, I would definitely recommend this costume to any mom who has boys who love to wear costumes like this. 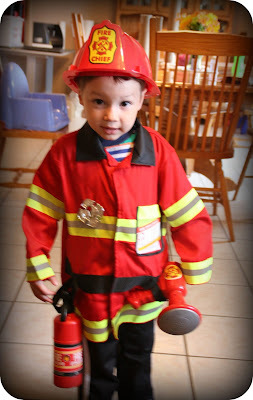 My boys are enjoying this costume and totally feel like real firefighters! It currently is retailing for $31.18. Head on over to Costume Discounters today and check out their entire selection of costumes today or, check them out on Facebook.